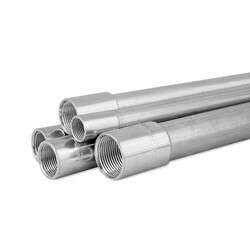 We offer qualitative steel conduit pipes, which can be offered in varied sizes and thickness. Our range is available at industry leading prices to our clients. outdoor or indoor for use with all types of galvanized steel conduit pipe fittings. Made from the best quality mild steel using the most modern high frequency Induction Tube Welding (Electric Resistance Welding) Technology, AKG rigid Steel Pipes are available in sizes from 20mm to 50mm with two type of protective coatings against external influences. We are offering Steel Conduit Pipe to our clients. We offer Mild Steel Conduit Pipe. We provide our customers high quality of Rigid Steel Conduit Pipe, which is designed employing exceptional quality material at progressive infrastructure facility. 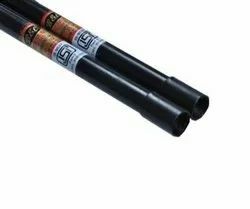 Made from the best quality mild steel using the most modern high frequency Induction Tube Welding (Electric Resistance Welding) Technology, AKG rigid Steel Pipes are available in sizes from 20 mm to 50 mm with two type of protective coatings against external influences.